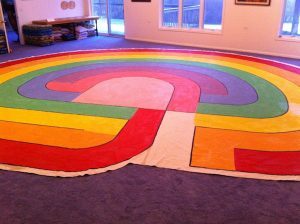 We offer 2 different handmade canvas labyrinth rental designs that can be reserved for various indoor functions or purchased. These labyrinths are designed to be walked without shoes and placed upon a clean, indoor surface. 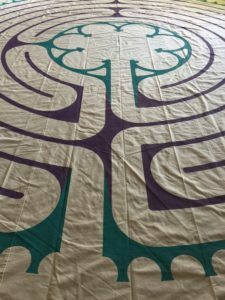 Before filling out the canvas labyrinth rental agreement below, send us an email by Clicking here or call us (847-842-1752) to check availability for the labyrinth you prefer. You may also download and fill out the rental agreement below and send it back to us and we will get back with you within 24 hours to let you know availability. Our 24′ diameter, 7-Circuit Chartres Essence is a round, condensed version of the full Chartres pattern, allowing it to fit in more spaces. Accommodates up to 25 people comfortably at one time Weighing about 45 lbs. and having a 10-1/8″ path width and 6 1/2′ diameter center (which is specially designed for larger groups to enjoy the center at the same time), the Chartres Essence design maintains the symbolism, elements, sacred geometry and quality of the full 11-Circuit Chartres Cathedral design nestled within a smaller diameter design. Rental: $250 per week. 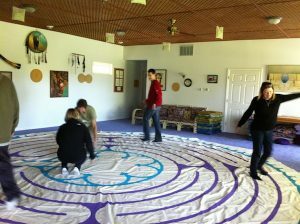 If you’d like to rent the Chartres Essence, click here to send us an email or call (847-842-1752) to check on dates and availability or fill out and return the Labyrinth Rental Agreement below. The 8-Colored , 25 x 22 foot, painted canvas, 7-Circuit Cretan has 1-1/2 foot wide paths and a 6-foot wide center, weighing approximately 50 pounds. 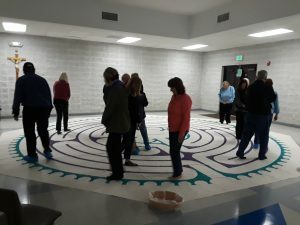 Hand-painted in 1998, this labyrinth has been used for many indoor events across the country and the paint has seen some wear. Accommodates up to 25 people comfortably at one time (has had as many as 100 people walking it together!) Rental: $215 per week. 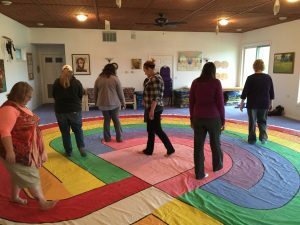 If you’d like to rent the 8-Colored Cretan, click here to send us an email or call (847-842-1752) to check on dates and availability or fill out the Labyrinth Rental Agreement below.